Singer Jewel was on The Chew with a delicious Southern treat fresh from the oven. 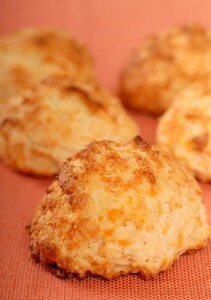 Check out her Cheddar, Jalapeno and Bacon Biscuits Recipe. Jewel is The Chew’s most frequent guest so far, notching three or four appearances over the last year and a half. They are always happy to have her back, especially when she travels with her guitar. She reminded everyone that it is important to start with cold butter for best results. The Chew welcomed frequent guest Jewel back to the kitchen to make her Southern style Cheddar, Jalapeno and Bacon Biscuits Recipe, with lots of butter. Heat bacon in a skillet over medium. Cook until crispy and let drain on a paper towel. Cook jalapeno in bacon fat and cook until soft, about less than 25 seconds. Remove and let drain on bacon plate. Save a couple tablespoons of the bacon fat and let it cool to room temperature. Crumble bacon into small pieces and chop the jalapeno. Preheat oven to 425 F and prepare a baking sheet. Mix flour, bacon fat, butter, and 1/2 tsp Salt in a bowl. Knead dough and mix until butter is the size of small peas. Mix in cheddar, bacon bits, and jalapeno. Form a depression in the center of the dough and add buttermilk, combining until wet. Knead dough on a flour dusted counter or cutting board until just combined. Use a rolling pin to flatten the dough to 1”. Cut out biscuits, about 3” in size, and place on baking sheet. Brush biscuits with melted butter and top with pepper before baking. Cook about 12-15 minutes, until golden. Let stand five minutes before serving.